The best thing is, it’s not a race! You can run, walk, jog or even dance through the bubbles. It’s suitable for all ages and abilities - there's no minimum or maximum age limit - and the course is pushchair friendly. 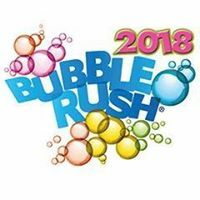 Birmingham Bubble Rush will be supporting a local charity. We will be announcing details of our charity partner for the event in March. There is no minimum sponsorship requirement to take part but we would be delighted if you would include some fundraising as part of your preparation for the event. If you sign up before we make this announcement we will send you an email with details of how you can support the charity. You can message us through this page, through Facebook or send us a message via our website. Our office is open 9am - 5pm on weekdays and we will respond as soon as possible. Please email YnViYmxlcyB8IGV4dHJlbWUtYWR2ZW50dXJlICEgY28gISB1aw== with any questions about your entry into Bubble Rush.